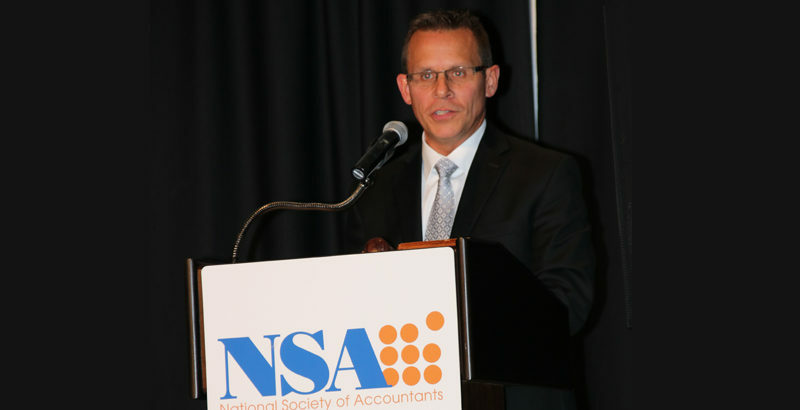 NSA’s 2017-2018 President, Brian Thompson shares his thoughts on the challenges and changes in the accounting world. MSP Congratulations on your new position as NSA’s President. Do you have any specific goals for the organization that you’d like to set into motion during your term? BT There are several goals we will be working toward this year. One goal is to work to increase the amount of accounting related information we provide to members. NSA does an exceptional job at providing a wealth of helpful information and guidance on tax related issues. While there are a vast number of changes in the taxation, our members need to be aware of issues that may affect the accounting side of your practice. Of course, we’ll continue to do an excellent job at keeping everyone informed on issues related to taxation. Another goal for the year will be to evaluate our member benefits to see if there are additional benefits we can add that would be helpful to our members. I am thankful to have so many talented people serving NSA on committees this year which will be working on these projects as well as many others. MSP Do you see any new challenges for accountants and tax preparers on the horizon? BT We seem to face challenges every day. While security may not be a new challenge, it is one that has escalated over the last year and will likely continue to an issue for each of us. I sure most of us have received emails and warnings from the IRS about security threats against tax preparers. A couple of years ago a local news reporter came out to our firm to interview me for a news piece about tax return identity theft. This was at a time when data from some very large companies had been breached and had caused some major concerns for the public. I recall telling the reporter during that interview that we had to be very cautious about securing our data as an accounting firm because we, as tax preparers, had basically all of the information that a hacker needed to steal someone’s identity. Large companies typically have substantial resources to help them protect their sensitive data. However, as Target and Home Depot can attest, hackers still found a way to breach their security. In our industry, tax preparation offices are usually small in comparison to the corporate world so we certainly have to be mindful and take precautions to try to make sure our computers and client information is secure. This increased security threat is likely not going away anytime soon. In addition, these threats are causing many of us to reevaluate how we do business, including how we communicate with clients which is another challenge. Another issue I see for small practitioners is the challenge of trying to recruit or attract younger staff people. Trying to find young staff that is willing to work in a small firm and work long hours during tax filing season is a daunting task. This is especially problematic for our more senior members who would like to retire someday. MSP How can NSA help our members and other industry professionals meet them head-on? BT There is power in having information or knowledge of what is going on the in the industry. While NSA may not have the means to send someone to your office to review your computer security, we have the resources to keep members informed about security issues members are facing. NSA is blessed to have a network of accountants and tax preparers all across the country that use Tax Talk. Everyday members are helping other members on Tax Talk with issues regarding clients, the IRS, state, and accounting problems. MSP Are there NSA member benefits that you believe are especially useful in this challenging environment? BT NSA has the several member benefits that are available to help our members stay informed about challenges in the industry. As challenges arise, look for informative articles in our newsletter, the NSA Practice Advisor, as well as the weekly and biweekly emails with the latest industry alerts. As I mentioned earlier, Tax Talk is an excellent member benefit where members share information about the issues they’re facing and receive excellent feedback from knowledgeable members who may have already faced the same issues. What a valuable benefit to be able to talk with someone who has been there and done that. MSP Brian, tell us a little about yourself. What inspired you to become an accountant? Where did you study? Are there accounting credentials that you feel are helpful for young professionals to consider as they grow in the profession? BT Accounting is actually my second occupation. I received my first college degree in Electronic Engineering Technology. After graduating college the first time, I took a job with a local company repairing office equipment such as computers, copiers, and calculators. I spent five years in the field as a service technician and was on a fast track to management. However, my plans were altered when the company I worked for suddenly filed bankruptcy as a result of some unethical behavior from our sister office in another part of the state. The service department I worked for was unexpectedly merged with another company across town and suddenly my management plans were significantly changed. My uncle, who is now my business partner, had an accounting firm. He came to me and suggested that I come to work for him and consider going back to college to get my accounting degree and then sit for the CPA exam. I remember that being a very tough decision because it would mean leaving a field I really enjoyed. I believe it took me about six months to finally decide and I left the field of electronics. I went back to the college and received a bachelor’s degree in accounting from the University of Arkansas and then passed all four parts of the CPA exam. That was 25 years ago and looking back one of the best decisions I could have made. MSP Your practice is in Little Rock, Arkansas. What sort of clients do you have? Is there any particular niche you prefer to focus on? Have you seen changes over the years, both positive and negative? BT Our firm has an office in Little Rock and also a small office in northwest Arkansas. We offer services in individual and business tax preparation, along with various accounting and payroll services. Our business clients are mostly small businesses in the service, retail industries along with a few manufacturing clients. If we have a niche, it’s working with small businesses. We seem to work a lot with brand new startup companies. It’s probably no surprise that one of the biggest areas of change over the years have been in technology. Over the last 25 years, I’ve went from printing clients accounting reports on a dot matrix printer to now posting reports on secure client portals. I remember backing up client data on separate floppy disks. Now we have cloud based computers that use incremental backups every 10-15 minutes. Clients once had to drive to our office to drop off and pick up accounting, tax, and payroll documents. Today, we import client transactions from banks and accounting systems and we are able to file most payroll tax returns along with payments online. Clients are able to upload information to portals, email, or fax documents which is used to prepare their tax return all without stepping a foot in the office. Fortunately advances in technology allow us to provide services much faster. Unfortunately, we are exposed to much more risk of penalties because we have been put in the position of making tax payments for clients via EFTPS and state online tax and payment systems. As a result, it has been very important to have a good system of internal control. MSP What are the things that keep you going and motivated? Hobbies? BT There are couple of hobbies that I enjoy that help keep me grounded. I appreciate music and enjoy playing the guitar. I’ve had the privilege of playing various instruments in church bands over the last 30 plus years. Currently, I play bass guitar for my church praise band. For me, music is therapeutic and relaxing. Another hobby that I enjoy is building remote control planes and quadcopters. It’s very satisfying to go to my work bench at home armed with a soldering iron, some motors, electronics, and hardware and work to create things that can fly. Well to be quite honest, in some cases the planes I build may not fly long. However, I find the process of building them and getting them to the runway as thrilling as the flight, regardless how short it may be. MSP Is there anything you’d like to share with your fellow NSA members? BT I feel that NSA has played a large part in the reason for the success in my own firm. When I think back, there are many reasons this success. Looking back I had several people that I considered mentors that encouraged me to get involved and serve on an NSA committee. I probably didn’t realize this at the time, but volunteering to serve gave me the fortunate side benefit of observing and getting to work with some very smart people in our industry along the way. Volunteering given me the opportunity to both network and learn from the best, as well as met some incredible people that I’m happy to call friends. I would like to encourage all of our members, especially our younger members to get involved. NSA needs your fresh ideas and your unique perspective. The benefits you receive from volunteering will more than make up for the time you invest in NSA.